The floors in the space where we hung the heavy bag are maple. Maple is strong, wears well, and is a great surface to work out on. Some of us like to workout barefooted and the hardwood feels nice against the skin. However, the floor surface has a coat of polyurethane and can get slippery if sweat gets on it. Also, sometimes it is nice to have a bit of a cushion. To satisfy the safety issue and the occasional desire for a more gentle surface, we did some research, tested some options, and found two types of padding which addressed our needs. Exercise and workout mats come in different configurations (interlocking , roll-up , panels ), are made from various types of materials (foam , rubber ), and in a variety of thicknesses. We wanted mats which could be put away quickly and did not take up a lot of room. After a bit of consideration, we settled on the interlocking 2×2 foam squares and the all rubber roll-up mat. Both the interlocking squares and roll-up mat were quick to set up and easy to stow. We did not go for the same thickness in the mats (1/2″ foam, 1/8″ rubber) so we would have more padding options. After using both the interlocking squares and the rubber mat, we found we preferred the Jade Yoga mat over the interlocking squares for several reasons. 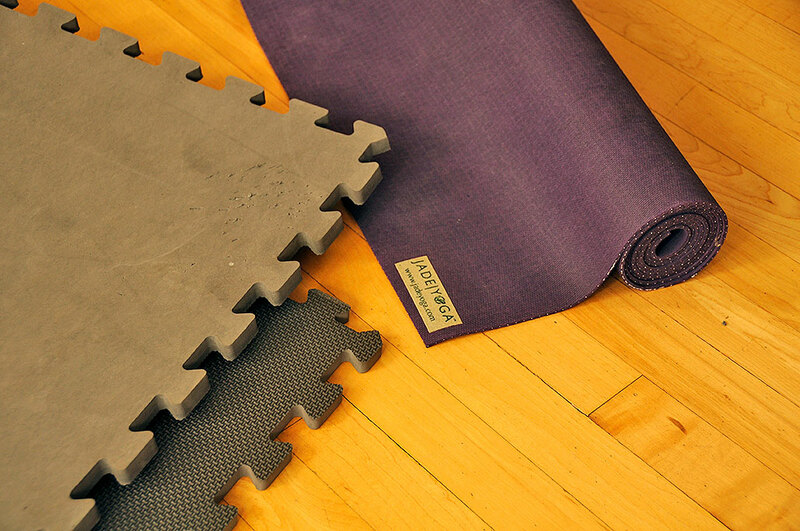 The 100% natural rubber Jade Yoga mat gripped firmly and gave excellent traction on the sealed floors. The foam squares do have a textured back and would have worked well if the surface was concrete, but on the maple floor it slid around more easily than we would have liked. The 1/8″ thickness of the Jade mat offered a little bit of cushioning without any spongy feel, excellent for moving about when working the heavy bag. The 1/2″ padding of the foam, while very comfortable, absorbed some of the power from the push of the legs when striking. 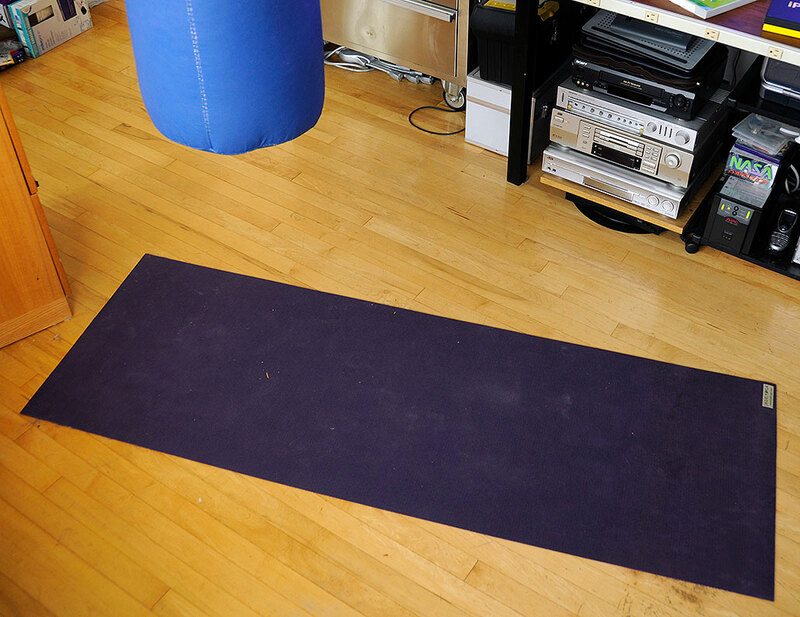 Even though we prefer the Jade mat for hitting the bag, we do use the foam squares for other parts of our workout. They are particularly helpful when doing various wrist-strengthening exercises. We could do the same exercise on the bare maple floor, but the conditioning of the knuckles have not yet caught up with the wrists. Until then, the foam padding let’s us go until fatigued. Being able to workout on a heavy bag in the office is certainly a treat, but getting enough exercise during an otherwise sedentary day is a necessity. Whether taking the stairs instead of the elevator, going for a walk during lunch, or doing some pushups to wake yourself up instead of reaching for that second cup of coffee, Just Do It.